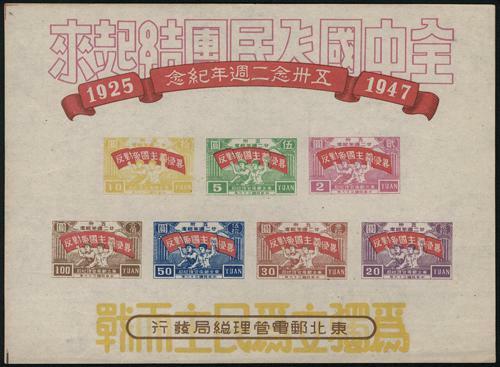 1946 North East China Mao Portrait 1st Print $2 imperf sheet of 100 (Chan NE2 imperf), unused without gum as issued. VF. 1947 North East Area (30 May) 22nd Anniv. of Naking Road Incident, Shangahi MS (Yang NE59M), unused without gum as issued. VF. 1947 North East Area May 30th Incident MS (Yang NE59M), unused without gum as issued. Unhinged, with some soft creases. VF-F.
1947 North East Area (30 May) 22nd Anniv. 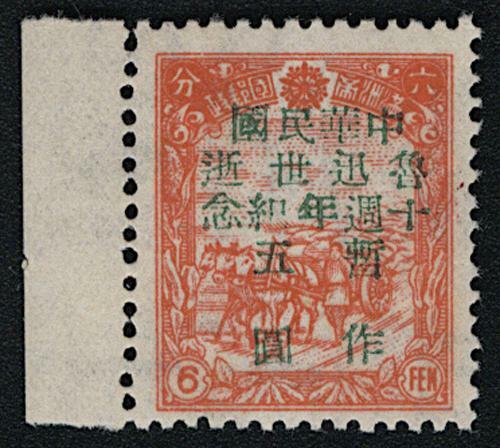 of Naking Road Incident MS (Yang NE59M), unused without gum as issued. Light toning on reverse. 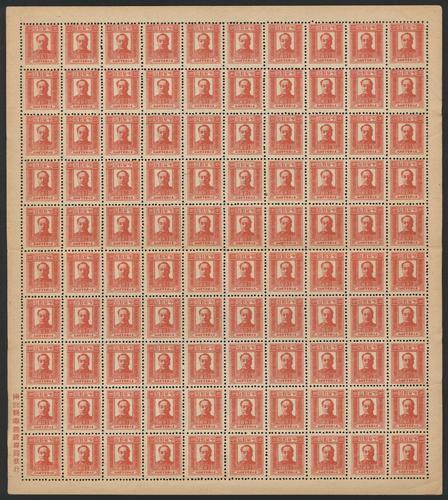 VF-F.
1947 North East China Mao Portrait 2nd Print $100 in sheet of 100 (Chan NE91 imperf), unused without gum as issued. VF. 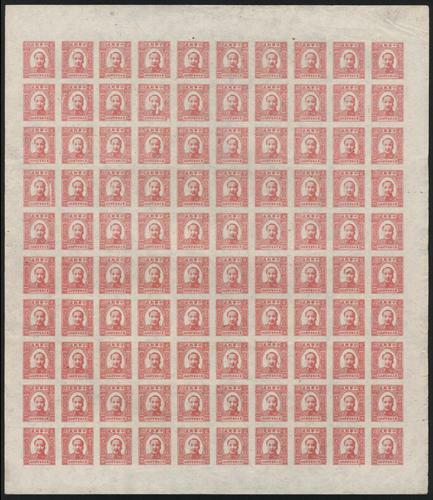 1947 North East China Mao Portrait 2nd Print $100 horizontal strip of 7 with imperf between variety (Chan NE91), unused without gum as issued. VF. 1946 North East Area Luda Post Labour Day set in blocks of 4 (AD7-9), fresh MNH with original gum. Slightly toned. 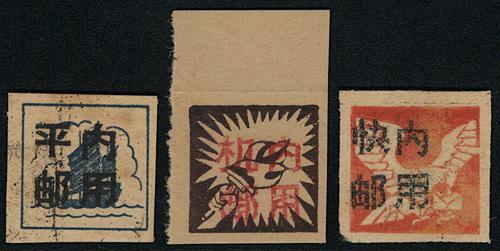 VF-F.
1946 North East Area Luda Post Japanese Surrender set in blocks of 4 (AD13-15), unused without gum as issued. Slightly toned. 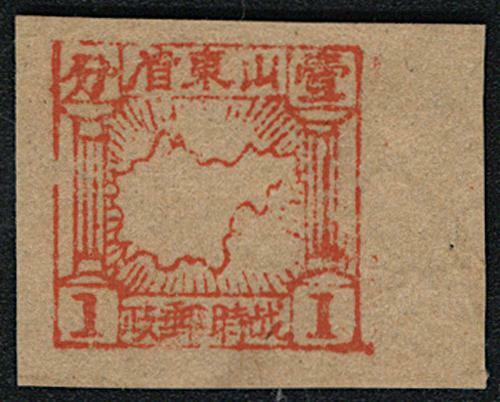 VF-F.
1946 North East Area Luda Post Death of Lu Hsun $5 on 6c horizontal pair with corner margin, left stamp with Chinese character variety (AD20F), fresh MNH with original gum. Very Fine. 1946 North East Area Luda Post Death of Lu Hsun $5 on 6c with left margin, with Chinese character variety (AD20E), fresh MNH with original gum. Very Fine. 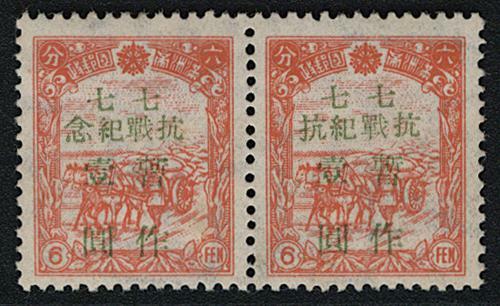 1946 North East Area Luda Post Outbreak of War with Japan $1 on 6c horizontal pair, right stamp with Chinese character variety (AD10c), fresh MNH with original gum. Slightly toned. 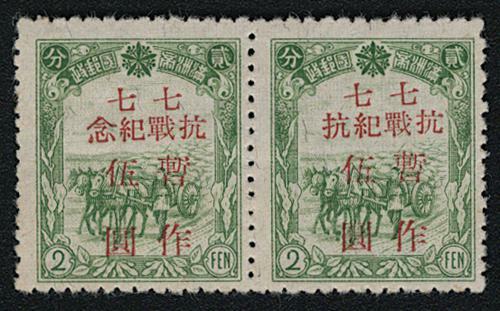 VF-F.
1946 North East Area Luda Post Outbreak of War with Japan $1 on 6c horizontal pair, right stamp with Chinese character variety (AD10b), fresh MNH with original gum. Very Fine. 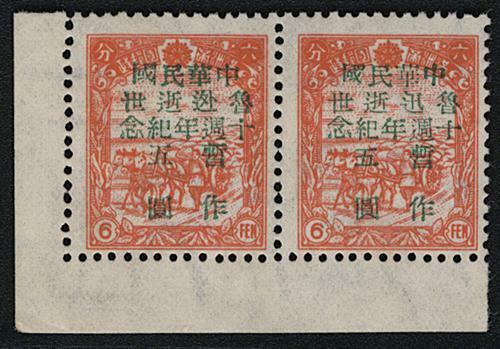 1946 North East Area Luda Post Outbreak of War with Japan $5 on 2c horizontal pair, right stamp with Chinese character variety (AD11b), fresh MNH with original gum. Very Fine. 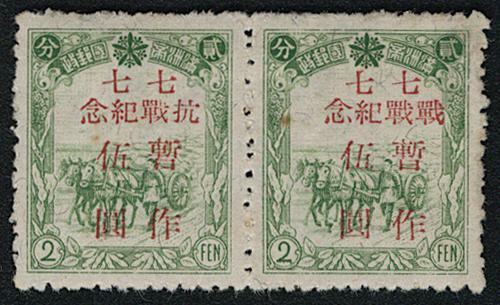 1946 North East Area Luda Post Outbreak of War with Japan $5 on 2c horizontal pair, right stamp with Chinese character variety (AD11c), fresh MNH with original gum. Slightly toned. 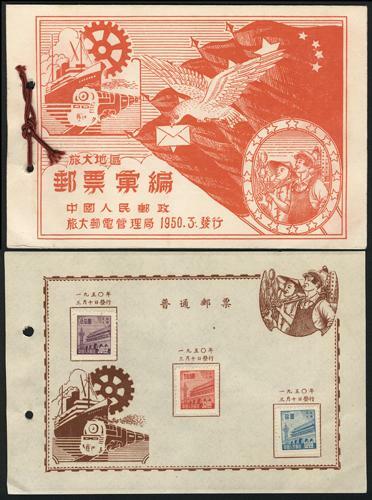 VF-F.
1950 Lv Da Postal Administration issued Lv Da stamps booklet, comprising 7 set of Lv Da Area commemorative issues and a set of Regular Issue. 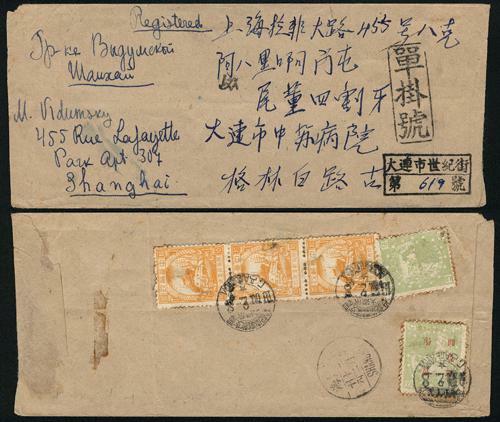 VF-F.
1950 (Feb 8) North East Liberated Area Luda District Dairen to Shanghai registered cover, franked on reverse Luda District stamps x 5, tied by clear Diren Branch Office cds., along with Shanghai arrival. 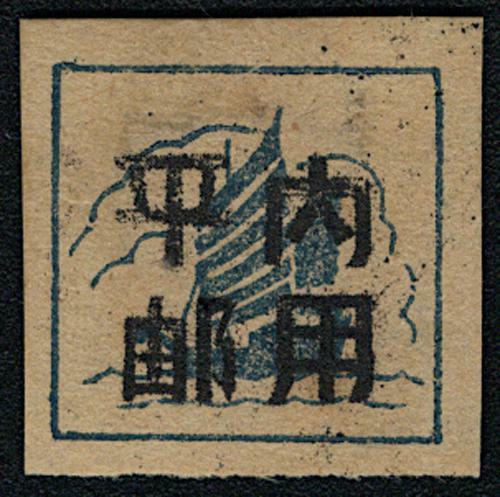 On front showing Dairen registered cachet. Cover folded once, but not affecting stamps or postmarks. VF-F. Very rare. 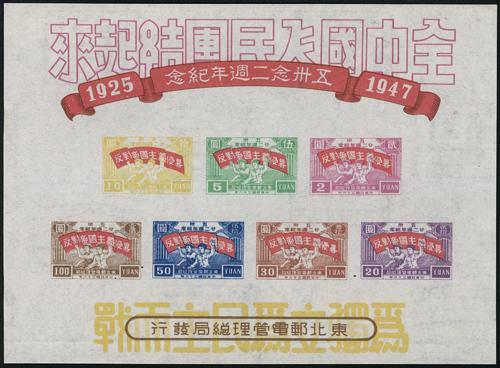 1944 East China Liberated Area Su-Chung District 4th Print "Unit Issue" Express Mail stamp (Yang EC269), unused without gum as issued. Unhinged. Slightly toned. VF-F.
1945 East China Liberated Area Su-Chung District Junk ovpt. 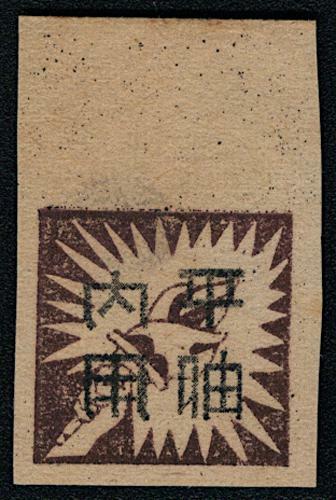 "内用平邮" (Yang EC275), unused without gum as issued. Hinged. VF-F.
1945 East China Liberated Area Su-Chung District Torch ovpt. "Internal Use" set of 3 (Yang EC275-277), all unused without gum as issued. Unhinged. Slightly toned. VF-F.
1945 East China Liberated Area Su-Chung District Torch ovpt. 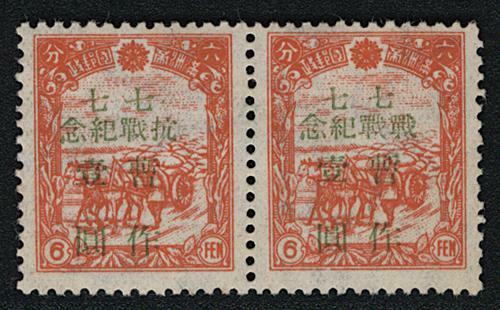 "内用平邮" with reverse characters (Yang EC278), with top margin, unused without gum as issued. Unhinged. Slightly toned. VF-F.
1946 East China Area Central China ovpt. 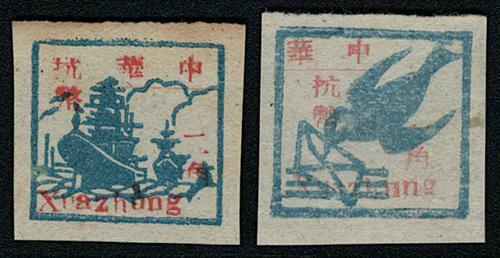 Xuazhung 10c & 20c (Yang 304 & 306), unused without gum as issued. Unhinged. Slightly toned. VF-F.
1946 East China Area Central China ovpt. 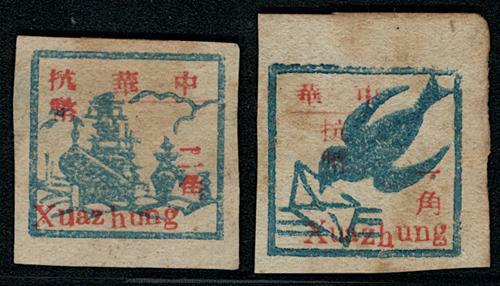 Xuazhung 10c & 20c (Yang 304 & 306), unused without gum as issued. Hinged. Toned. F-VF. 1946 East China Area Central China ovpt. 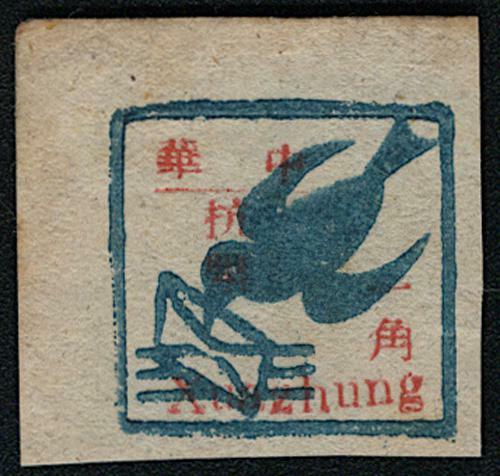 Xuazhung 10c (Yang 304), unused without gum as issued. Unhinged. Slightly toned. 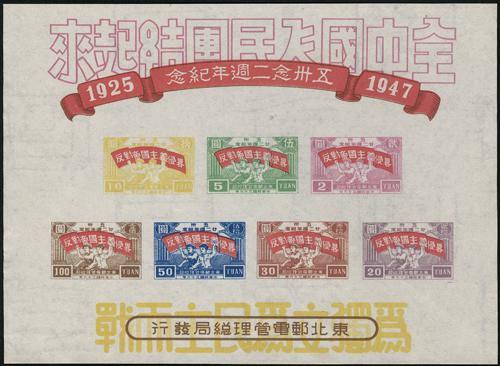 VF-F.
1947-49 East China Liberated Area Mao portrait surcharged $500 on $5 x 2, both with overprints misplaced variety (Yang EC190), unused without gum as issued. Hinged. Slightly toned. 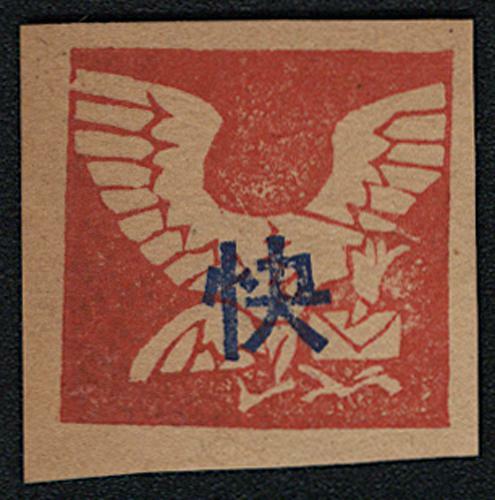 VF-F.
1942 Shantung 2nd War Time Post 1c vermilion with right margin (EC5), unused without gum as issued. Unhinged. Slightly toned. VF-F.